Heat dressing in large skillet on medium-high heat. Add broccoli; cook 3 min. or until tender, stirring frequently. Add shrimp; cook 5 min. or until shrimp is heated through. This is a great use for instant quick cooking rice or leftover cooked rice. 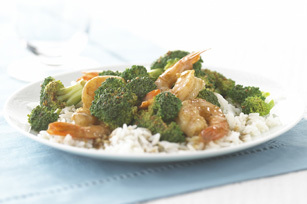 Substitute your favorite frozen vegetable blend for the broccoli.